"The AWARE Foundation is co-founded and run on a part time basis by Shirley, Vivian, Alfreda, and Rocky, who are animal professionals and Harry, an entrepreneur. We are all very passionate about promoting good animal welfare practices in Asia. 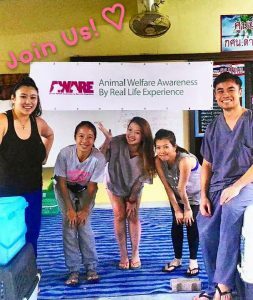 Our story started 3 years ago when Shirley shared her experience of volunteering at a rural animal clinic in Thailand. She noticed that despite their best efforts, the lack of resources, especially man power, was desperately lacking in these areas. Thus we decided to setup AWARE as a platform for animal nurses and veterinarians to volunteer at these rural animal clinics. AWARE, which stands for Animal Welfare Awareness by Real like Experience, is a win-win situation for all. Not only do the animals and clinics get the help they need, but the volunteers gain valuable knowledge on real world animal welfare issues, and also gain practical animal surgery skills. AWARE also holds talks and seminars at organizations such as schools. So far our results have been very encouraging, having operated on over 400 dogs and cats, and recruiting nearly 20 volunteers. We are very motivated when we see healthy animals, as well as when we receive positive feedback from our volunteers, clinics, and locals. With your support, we hope to continue to fulfil our goals as AWARE Foundation - to join forces with local animal charities, bringing veterinary care to stray animals, to educate local communities and raise animal welfare awareness across Asia."